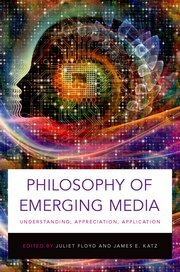 A new book on the philosophy of emerging media has been published by Oxford University Press, editors Juliet Floyd and James E. Katz. It does not have a focus on computer games specifically, but the wide variety of issues it discusses should certainly be of interest to our field as well. I have a paper in it called “Agential Properties in Computer Games”, which outlines the idea that games and computer games are based on non-representational “agential properties” projected using the same cognitive mechanisms as social ontologies make use of.